Ellen Oliver was born circa 1823 at IN.1 She married Ethiel Porter Holcombe, son of Rufus E. Holcombe and Nancy Gloyd, on 11 May 1843 at Ripley Co., IN. Ellen Oliver died on 16 May 1881 at Arlington, Columbia Co., WI. Luther Friend Holcombe was born on 4 November 1820 at OH.1 He was the son of Rufus E. Holcombe and Nancy Gloyd. Luther Friend Holcombe married Hannah Hartley on 27 April 1843 at Ripley Co., IN.1 Luther Friend Holcombe died in 1885 at Dearborn Co., IN. Luther and Hannah were enumerated in the 1850 Sparta Twp., Dearborn Co., IN, federal census, printed page 459. He was a carpenter age 29; Hannah was 31. Children in the household, all born in IN, were Thomas 6, John 5, Mary 3, and Elizabeth 2/12. Luther and Hannah enumerated in the 1860 Sparta Twp., Dearborn Co., IN, federal census on the same page with Rufus and Nancy. He was a carpenter, age 39, born in OH; she was 40, born in PA. The children in the household were all born in IN, and listed only by their initials; T. C. (male), age 16; M. A. (female) 12; J. D. (male), 15; E. R. (female) 10; A. H. (male), 8; H.E. (female), 6; Nancy A. 4; M. A. (female), 2. Luther and Hannah were enumerated in the 1870 Moores Hill, Sparta Twp., Dearborn Co., IN, federal census, page 27. He was a farmer, age 49; she was 53. Children in the household, all born in Indiana, were Lizzie, age 19, teaching, Anthony 17, Evangeline 16, Ann 14, and Amelia 11. Huldah Holcombe was born on 14 July 1826 at Moores Hill, Dearborn Co., IN.2 She was the daughter of Rufus E. Holcombe and Nancy Gloyd. Huldah Holcombe married John Oathoudt, son of Isaac Ooathoudt and Harriet Faulkner, on 30 November 1845 at Baptist Church, Sparta, Dearborn Co., IN.2 Huldah Holcombe died on 4 June 1908 at Hayden, Jennings Co., IN, at age 81. John Oathoudt was born on 7 March 1824 at Dearborn Co., IN. He was the son of Isaac Ooathoudt and Harriet Faulkner. John Oathoudt married Huldah Holcombe, daughter of Rufus E. Holcombe and Nancy Gloyd, on 30 November 1845 at Baptist Church, Sparta, Dearborn Co., IN.1 John Oathoudt died on 22 December 1916 at Hamilton Township, Jackson Co., IN, at age 92. Hannah Holcombe was the daughter of Rufus E. Holcombe and Nancy Gloyd. Samuel served in the Union Army, Company B, 52nd Indiana Volunteers. Elizabeth and Samuel were enumerated in the 1870 Moores Hill, Sparta Twp., Dearborn Co., IN, federal census, page 32, living next door to Nancy Holcombe. Samuel was a farmer age 46; she was 42. 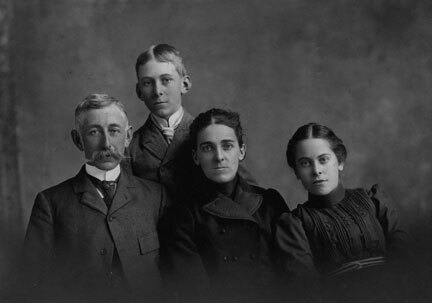 Children in the household, all born in Indiana, were Piercy 16, Wilson 13, Lydia 12, and George 5. Turner Gloyd Holcombe was born on 1 May 1832 at IN.1,2 He was the son of Rufus E. Holcombe and Nancy Gloyd. Turner Gloyd Holcombe married Sarah Lucinda Walker on 2 December 1855.1 Turner Gloyd Holcombe lived at Caldwell Co., MO. He died in 1905. Turner was a builder, probably well respected. They had the good fortune of settling on land that held some of the richest oil reserves in the U.S. Four of TGH's children became school superintendents. They built a home called "The Rest" that would seat several hundred for dinner, and had large formal gardens. Turner and Sarah were enumerated in the 1860 Sparta Twp., Dearborn Co., IN, federal census, page 20. He was a carpenter age 28, born in IN; she was 23, born in IN. Children in the household were William L., age 4; and M. ?., age 1. Turner and Sarah were enumerated in the 1870 Moores Hill Post Office, Sparta Twp., Dearborn Co., IN, federal census, page 26. He was a farmer age 37, she was 32. Children in the household, all born in IN were Walter 13, Florence 11, Hannibal 8, Morton 5, Blanche 3, and Charles 5. Turner and Sarah were enumerated in the 1880 Richland, Butler Co., KS, federal census. He was 48, she was 43. Children in the household were Walter L. 23, M. Florence 21, Hannibal T. 18, Morton R. 15, S. Blanche 13, Charles F. 10, John J. A. V. 4, and Robert Ruald 1 month. Nancy Holcombe was born on 14 September 1830.1 She was the daughter of Rufus E. Holcombe and Nancy Gloyd. 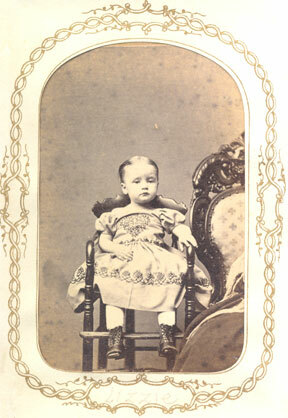 Lydia Faulkner Holcombe was born on 27 January 1834.1 She was the daughter of Rufus E. Holcombe and Nancy Gloyd. Rufus Philander Holcombe was born on 30 November 1838.1 He was the son of Rufus E. Holcombe and Nancy Gloyd. Rufus Philander Holcombe died in 1858 at Dearborn Co., IN. Edwin Perry Holcombe was born in 1848. He was the son of Eli Asa Holcombe and Emmeline Hall. Edwin Perry Holcombe died in 1850. Louis Philander Holcombe was born in 1850. He was the son of Eli Asa Holcombe and Emmeline Hall. Louis Philander Holcombe died in 1851. Daniel Wesley Holcombe was born on 11 January 1852 at Ripley Co., IN. He was the son of Eli Asa Holcombe and Emmeline Hall. Daniel Wesley Holcombe married Mary E. Evans, daughter of John Evans and Nancy Robbins, in May 1873. Daniel Wesley Holcombe died in 1934 at Fayette Co., PA.
Mary E. Evans was born on 25 September 1855. She was the daughter of John Evans and Nancy Robbins. Mary E. Evans married Daniel Wesley Holcombe, son of Eli Asa Holcombe and Emmeline Hall, in May 1873. Georgia Evangeline Holcombe was born in 1853. She was the daughter of Eli Asa Holcombe and Emmeline Hall. Georgia Evangeline Holcombe died in 1854. Emmeline Celestina Holcombe died at Wichita, Sedgwick Co., KS. She was born in 1855 at IN. She was the daughter of Eli Asa Holcombe and Emmeline Hall. Eli Benson Holcombe was born in 1859. He was the son of Eli Asa Holcombe and Emmeline Hall. Eli Benson Holcombe died in 1925. Perhaps it is this Eli enumerated in the 1900 Douglass Township, Butler Co., KS, federal census, ED 8, page 1A. He was a RR laborer, born Feb 1860 in Indiana. His wife was Luclla, age 29 born in KS. There were two daughters in the household, Lula H. age 6, born in KS, and Gladys age 4, born in OK.
Walter Scott Holcombe was born in 1861 at IN. He was the son of Eli Asa Holcombe and Emmeline Hall. Walter Scott Holcombe died in 1954. Ran away from home and became a farmer in Imperial Valley, CA. Caroline Medora Holcombe was born in 1863. She was the daughter of Eli Asa Holcombe and Emmeline Hall. Caroline Medora Holcombe died in 1908. John and Caroline were cousins. Benjamin Holcombe was the son of Eli Asa Holcombe and Emmeline Hall. Emmeline Celestia Holcombe was buried at Woodbine, KS. She was born in 1879. She was the daughter of George Albert Holcombe and Effie Alice Oldham. Emmeline Celestia Holcombe married Joseph B. Timm. Emmeline Celestia Holcombe died in 1957. 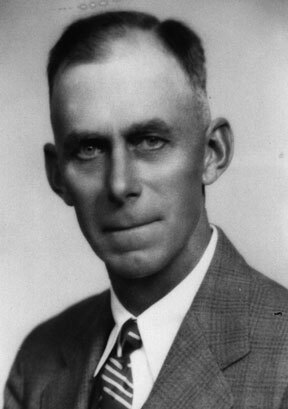 Joseph B. Timm was born in 1883. He married Emmeline Celestia Holcombe, daughter of George Albert Holcombe and Effie Alice Oldham. Joseph B. Timm died in 1928. He was buried at Woodbine, KS. Walter Leroy Holcombe was buried at Belmont, KS. He died in 1892. He was born in 1892. He was the son of George Albert Holcombe and Effie Alice Oldham. John Ross Holcombe was born on 16 December 1988 at Bakersfield, Kern Co., CA. He was the son of Brian Ross Holcombe and Jane Ellen McGrath. McPherson lists Samuel as a son of Sabra, Nahum's first wife, while Carol Laun of the Salmon Brook Historical Society lists him as a child of Nahum's second wife, Orpha. Carol provides the death date of Sabra as 1849. Samuel was listed in Greer's Hartford City Directory as a State Representative from Granby. Samuel was listed in the 1900 census of Granby, CT, page 8A, line 44, age 44, as a farmer. Lissie was listed as 39, Tudor 13, and Laura 12. Samuel was listed in the 1920 census of Granby, CT, page 4A, line 43, age 64, as a farmer. Lizzie was listed as 59, Tudor 32, and Laura 31. Samuel was enumerated in the 1930 West Granby Village, Granby Town, Hartford Co., CT, federal census, page 13B. He was a dairy farmer, age 74; Lizzie was 69. Tudor 43 and Laura 42 were also in the household. Tudor Frederic Holcombe was born on 7 June 1886 at West Granby, Granby, Hartford Co., CT.3 He was the son of Samuel Frederic Holcombe and Lizzie Laura Dewey. Tudor Frederic Holcombe died on 10 February 1978 at Avon, Hartford Co., CT, at age 91. In 1940 named Connecticut's Farmer of the Year for his long history of experimentation and innovation in both tobacco and dairy farming. he had served in the state legislature, and on the first town zoning and finance commissions, and had regularly opened his huge barn loft to church suppers, dances and political fund-raisers. He and Laura had financed a new town hall, firehouse, and cemetery upkeep, and they had given large sums to the University of Hartford and the Hartford Foundation for Public Giving. Today, their farm is known as the Holcomb Farm and is the property of the Town of Granby. In 1990, the farm was placed on the state register of historic places, and in 1992, it was the centerpiece of the West Granby Historic District which was placed then on the National Register of Historic Districts. Tudor was enumerated in the 1940 Granby, Hartford Co., CT, federal census. He was a farmer, age 53. Also in the household ws his mother Lizzie 80, and sister Laura E. 51. [S164] Carol Laun, Holcombe Collection, Pages 98-105. Laura Emma Holcombe was born in 1888 at West Granby, Granby, Hartford Co., CT. She was the daughter of Samuel Frederic Holcombe and Lizzie Laura Dewey. Laura Emma Holcombe died on 18 March 1980 at Avon, Hartford Co., CT.
After their marriage, Flora and N. Worthington intended to live in West Granby. He died as a consequence of being run over by a cart; no children. [S75] Holcombe. Seth P., Phineas Holcomb, Page 21. Phinehas Holcombe was also known as Phineas Holcombe. He was born on 17 March 1759 at West Granby, Granby, Hartford Co., CT.6,7 He was the son of Reuben Holcombe and Susanna Hayes. Phinehas Holcombe married Elizabeth Gibbs Moore, daughter of Jonah Moore and Mary Ridout, on 26 April 1781 at Congregational Church, Turkey Hi.6 Phinehas Holcombe left a will on 18 April 1829 at New Hartford, Litchfield Co., CT. He died on 7 February 1833 at West Hill, New Hartford, Litchfield Co., CT, at age 73. McPherson gives a different birth date, 15 April 1759. Phinehas was placed on the pension roll, 1832, for service as private in Capt. Matthew Smith's company, Connecticut militia, General Waterbury's brigade. "The New Hartford Branch of the Holcombe family commenced when Phinehas Holcomb moved from his home, which was adjacent to his father's in West Granby, going to the top of West Hill in New Hartford. "We can find Phinehas there by virtue of the deed filed on the New Hartford Land Records in Volume 7 at page 86, dated December 22, 1797, which transfers from Simeon Merrill to Phinehas Holcomb the property. . . . . The consideration was $1,833.33. "It is interesting to note that though this piece is the first land possession in New Hartford by Phinehas, he caused himself to be described then as "of New Hartford." Perhaps he boarded with someone in the town or even was a tenant on the premises before he made the purchase. "The location of the property is at the top of West Hill, where "Overledge" now stands. Let it be noted here that the name "Overledge" was first used by Mr. and Mrs. John M. Holcombe after they acquired the premises from Cousin Worthington Eugene Holcomb. Then in 1913 John M. Holcombe built "Overledge" upon the foundation of the dwelling purchased by Phinehas n 1797. "No matter from what direction, to get to Phinehas's house, a steep hill presents itself. In those days with transportation only by horse or oxen, one wonders why he chose a home at the top of the hill. I asked Cousin Howell D. Holcomb, 'Why located at the top of the hill instead of farming in the rich river valley of the Farmington River which contained less stones with which to contend?' He replied that the late spring and early fall frosts will only touch the valleys; moreover the stones hold the heat making the soil warm for promoting growth of the crops so necessary for both humans and animals. Mark C. Williams of West Granby, who lives near the original Holcomb property, confirms this thought, as his own orchard blossoms have been frost-bitten when most other places have escaped. "Let us look at Phinehas in 1797, when he acquired these beautiful New Hartford premises. He was 38 years old; he had been married for 16 years; he and his wife shared parenthood of six children; three more would arrive. He had been living in West Granby where his father, Reuben, had given him 35 acres; in addition, on his own he had acquired 20 acres from Lemuel Kilborn. "To locate today the exact premises (now in West Granby) on which Phinehas and his father, Reuben, lived presents more of a problem than just reading the boundaries in Volume 13, page 257 of the Simsbury Land Records." "This lot, although altered in shape somewhat over the years, is essentially the core of Broad Hill Farm, which remained in the hands of the same family until Reuben’s great-great-grandson Tudor Holcomb gave the farm to the University of Connecticut a few years ago. In fact, many of the old stone fences that marked the old lots laid out perpendicular to the town's western border (at WNW angle) are still in place and aided in this research." Seth included the complete text of Phinehas' will, noting that the will and signature were in the same handwriting. In the will Phinehas mentions "son Harmon", "son Phinehas", and "son Schuyler", noting that Phinehas and Schuyler were then deceased. Seth also cites Connecticut Men in the Revolution, Simsbury Vital Records, and the New Hartford Town Records. [S65] Deanna Holcomb Bowman Thomas Holcomb, Vol. I:Pg. 154/Item 81254. [S23] Jesse Seaver, The Holcomb(e) Genealogy, Page 86/Item 244. [S25] Hannah McPherson, Holcombe Genealogy, Page 123.2/Item A-8-1-2-6-4. [S104] DAR DAR Lineage book, Vol. LV:Pg. 72/Item 54176; Vol LXXIX:Pg. 146/Item 78391. [S75] Holcombe. Seth P., Phineas Holcomb, Page 1/Item 1. [S45] Albert C. Bates, Simsbury, Page 53. Reuben Holcombe II witnessed the adoption of Delia Jane Dwight. Reuben Holcombe II was born on 10 January 1751 at Simsbury, Hartford Co., CT.2 He was the son of Reuben Holcombe and Susanna Hayes. Reuben Holcombe II was graduated in 1774 at Yale, New Haven, CT. He married Jane Strong, daughter of Rev. Joseph Strong and Jane Gelston, in 1779. Reuben Holcombe II witnessed the adoption of Deacon Augustine Holcombe. Reuben Holcombe II married Abigail Adams on 4 June 1823.3 Reuben Holcombe II died on 18 October 1824 at Sterling, Worcester Co., MA, at age 73. He was graduated at Yale, A.B., 1774; A.M., 1778, and studied divinity under the Rev. Dr. Joseph Strong, of Simsbury, Conn., whose daughter Jane he married. 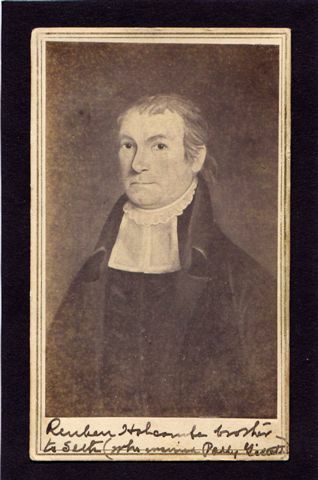 He was ordained, June 15, 1779, and was pastor of the First Congregational church in the West Parish of Lancaster (now Sterling) Mass., 1779-1814. With the Rev. Dr. Aaron Bancroft and six others, he founded the "Worcester Association," which compiled the Worcester catechism. He owned the best farm in Worcester county, raised hemp, cultivated the silk-worm, and his wife wove silk from the cocoons. He received from the Massachusetts Society for the Promotion of Agriculture a silver tankard valued at £13 sterling, for an essay on "the Best Method of Raising Wheat" (1790). He opposed war with Great Britain in 1812, and published two sermons on the subject. He educated over a score of young men for the ministry, prepared many for college, and advocated the higher education of women. He adopted Capt. Augustine Holcombe, son of his brother Nahum, and working together they were pioneers in improved methods of agriculture and horticulture in Massachusetts. McPherson, page 123.1 gives his birth date as 11 Feb 1752. [S25] Hannah McPherson, Holcombe Genealogy, page 123.1/Item A-8-1-2-6-1. [S84] Benjamin Woodbridge Dwight Elder John Strong, Vol. I, page 356. Seth Holcombe was born on 31 December 1756 at Granby, Hartford Co., CT.3 He was the son of Reuben Holcombe and Susanna Hayes. Seth Holcombe married Polly Gillett, daughter of Frederick Gillett, in 1775. Seth Holcombe died on 28 July 1810 at Canandaigua, Ontario Co., NY, at age 53.4 He was buried at Woolhouse/Hunn Cemetery, Canandaigua, Ontario Co., NY. There are conflicts with Seth's birth date. The Simsbury vital records lists 31 December 1756; the Annis Holcombe Tracy album lists 3 January 1755; the Woolhouse/Hunn Cemetery in town of Canandaigua, Ontario County, NY, lists 3 January 1755, but says he was born in Granby, MA. Seth enlisted as a private, June 5, 1775 in Capt M. Henry's Co., Col. D. Brewer's Regt; served as private in Capt. Samuel Hayes' Co., Col. Johathan Pettibone's 18th NY Regt. of militia, arriving NY Aug 26. discharged there Sept 25, 1776; became early settler and Indian trader Canandiagua, where he is recorded with his family in the 1790 census. [S25] Hannah McPherson, Holcombe Genealogy, Page 123.1/Item A-8-1-2-6-3. [S104] DAR DAR Lineage book, Vol. LIII:Pg 381/Item 52820; Vol. LXXII:Pgs. 169, 170/Items 71470, 71471; Vol. CX:Pg. 178/Item 109571. Some of the information on Increase and his descendants is from a bible given to Mary Reed at the time of her marriage to Increase. She willed it to her eldest daughter to be given to the eldest in each succeeding generatioin. Melissa Holcombe Ensign had it from Feb. 11848 to July 1853. Eunice Melissa Ensign had it from July 1853 to April 1893. Sarah Jane Enisgn had it from April 1893 to November 1908. Etta Baker Ensign Weddle had it from Nov. 1908 to 26 April 1963. Gertrude Ward had it from April 1963 to April 1991. Barbara J. Carney recieved it in 1991. It is assumed that one of her daughters, Kathy or Susan, now has the bible. Increase served as a private in the American Revolution for which a US pension for him is recorded in Hartford Co., CT. He is listed as the Patriot for DAR member 7043. Carol Laun has him born 10 Jan 1761, but acknowledges using Seaver instead of SVR. [S25] Hannah McPherson, Holcombe Genealogy, Page 125.1/Item A-8-1-2-6-5. [S104] DAR DAR Lineage book, Vol. VIII:Pg. 15/Item 7043. [S414] Hon. Horace L. Moore, Andrew Moore, Page 75. Roswell Holcombe was born on 26 October 1766 at Simsbury, Hartford Co., CT.1 He was the son of Reuben Holcombe and Susanna Hayes.